As Windows 10 RTM is getting nearer to release date, Microsoft is on rapid firing mode, releasing build after build of Windows 10 Technical Preview to Windows Insiders for beta testing in order to iron out bugs and issues. Windows 10 Build 10162, released on July 2nd, 2015, is the 3rd release of new Windows 10 preview builds in 5 days. Windows 10 Build 10162 is promised to have better reliability, performance, battery life, and compatibility than any Windows 10 Insider Preview build so far by Microsoft. 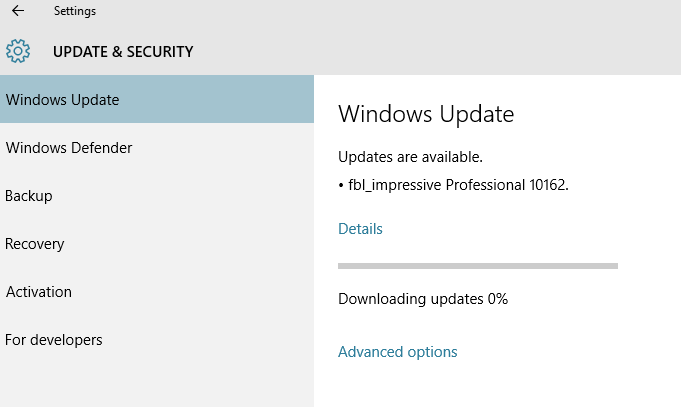 Windows 10 Build 10162 of fbl_impressive branch has the build string of 10162.0.150629-1700, and is currently flighting to Windows Insiders on the Fast ring. The build is a candidate for the Windows Insiders on the Slow ring too, and if yes, it will be has also been made available to Windows Update for those on Slow ring flight, and also published in ISO images format early next week and the ISOs for Windows 10 Build 10162 have been released ahead of Slow ring flight. Download and upgrade to Windows 10 Build 10162 via Windows Update.